It’s nice that you like the sprites, but as a request, no. Making a new sprite from scratch takes hours. can u sprtite artemis foul from full mettel alkamist? I’ll admit it’s tempting, I always wanted a tree of fiddies. Ephraim decided to try casting some spells, but neglected the fact that A, he doesn’t know how, and B, that’s not even a magic tome. It is, however, a big, heavy hardcover, so it seems to have worked out. I bet he promotes to Judge. Ok but does he still twirl it around when he gets a critical? I won’t judge your sense of humour. He probably would, I mean, this is Ephraim we’re talking about. Pretty sure its a ROBLOX manual. A heavy one at that. Oof. I was thinking more along the lines of an epic romance novel he grabbed out of Eirika’s shelf. Oof. Not sure what would cost more. Lyon’s insurance, or Ephraim’s insurance. 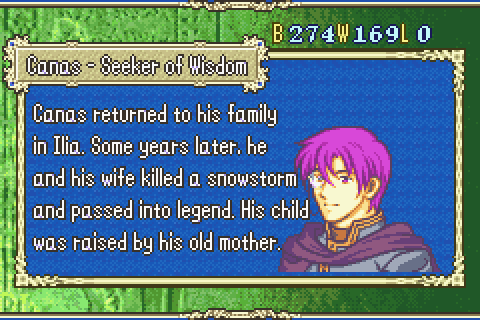 Isn’t Canas’ wife an anima user? They are using anima magic! They just like to wear matching sweaters ok.
Wow, you did an animation with two battlers at once. I really like that concept. Due to limited vram space, dual attacker/defender would be very tricky to do and would probably require a complete rework of the animation system. I think there’s enough palette ram for 4 palettes, though. Just making them into a single animation worked without issue for the druid. I could see it taking up too much space if it’s a more elaborate animation, though. does that mean we could actually be using like 60 colours in battle animations? You couldnt actually use all those colors on a single 8x8 tile, but with some shenanigans you could make certain tiles use 16 color palette 1 and other tiles use color palette 2, which would allow for 32 colors. (actual 32 colors isnt possible on the gba, due to palette addressing being 4 bits per pixel, so the cap is 16.) It’s porbably more work than it’s worth, though.